Carpet fans are high-powered air circulating fans that are ideal for drying out flooded basements, wet carpet, and providing cooling air circulation in confined spaces (Source). They are engineered to be portable, compact, durable but still extremely powerful-useful for residential as well as business purposes, frequently employed by janitorial staff or professional carpet-cleaning companies (Source). These carpet fans feature different speed settings and operating angles so that you can position the airflow to surge across the floor, straight up in the air, or at 45° angles. 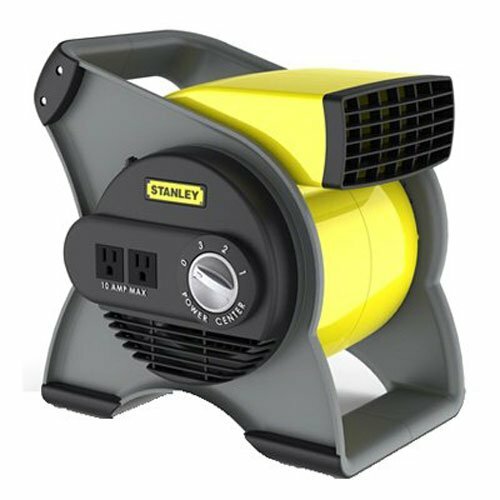 The Stanley high velocity blower fan is one of our favorites. Its users say that it is excellent to use in confined areas where fresh air is at a minimum. This is often the case in basements, garages and moldy attics. As well, it's great for drying furniture, walls, carpets and floors. Even pets, since they don't produce heat! One reviewer who purchased the Stanley carpet fan says that it is incredibly strong, pushing high volumes of air in a very focused stream, and does it pretty quietly, as well. This particular reviewer likes that you can pivot it 180°, allowing you to rotate it while it is positioned on the floor to adjust airflow. Another reviewer writes to us that the fan has three truly differentiated speed settings. Unlike other carpet and high velocity fans that often have speed settings that aren't truly that different, this Stanley Lasko carpet fan doesn't count the off button as one of its speed settings. Other buyers were impressed by the solid feel of the plastic case- and also say that the noise it creates is similar to that of a white noise machine. Let's take a look at five of the best-selling carpet blowers on the market today and see how they compare. The Shop-Vac mini air mover is powerful, efficient, and convenient for drying carpets and floors. Users love the compact, portable design, but some do note that it’s smaller than what they expected. With a size of 15″ x 15″ x 10.5″, this air mover blower has 3-speed settings, three operating positions, a 10-foot power cord, a top carry handle, an on board cord wrap, and an airflow capacity of 500 CFM. The built-in outlets allow you to connect multiple units, and it’s an excellent choice if you need an inexpensive air blower. In general, users are extremely satisfied with the performance, functionally, and durability of the mighty mini air blower and they use it to dry carpets or cool off garages and workshop. One buyer shares that he has had this carpet blower fan for about three years, and it has performed flawlessly and efficiently without getting overheated. The reviewer also states that the floor carpet fan is made of hard-to -crack plastic, and that despite its small size it moves plenty of air around, and he can easily store it anywhere he wants. A happy customer mentions that the Shop-Vac air blower fan does an excellent job of drying out his basement when it gets flooded, and it works quickly and noiselessly. However, some reviewers have complained that this mini blower is as powerful as a hairdryer and not a good choice if you are looking for a fan that really moves air. Some also state after several weeks of use the carpet mini fan starts to make noises. This carpet dryer blower fan offered by CFM Pro is convenient, portable and suitable for professionals. Users love the lightweight construction, but some do note that you can’t chain link it with other units. With a size of 14.5″ x 15.25″ x 17.5″, this floor air blower fan has a powerful CFM output, three blowing positions, two speeds available, a 15-feet power cord, four anti-slip feet, a rugged handle, and it’s ELT listed. It is made of durable polyethylene composite, and you can place it flat on the floor or inclined to a 45 or 90-degree angle, so this is an excellent choice if you are looking for a practical carpet blower. Users have a favorable opinion towards the CFM Pro floor dryer fan. One buyer mentioned that he used this air mover for several months almost continuously to ventilate his roof without any issues or overheating. The reviewer also states that the power cord is long and durable, and he highly recommends this small fan dryer. Another customer commented that he was surprised how quickly he managed to dry out his basement with the help of the CFM Pro air blower carpet fan and that it’s so lightweight that he can move it around effortlessly. A happy purchaser also shares that he was astonished by the amount of air that the fan generated and that it was delivered quickly and in good condition. However, some customers are not satisfied with the airflow, and they complain that there is no CFM rating provided. One user also complained that the motor shaft broke. If you are wondering how to deal with your wet carpet quickly and efficiently, you might try the Contair high-velocity carpet dryer. Users love the price and the powerful airflow, but some do note that it’s too small for them. 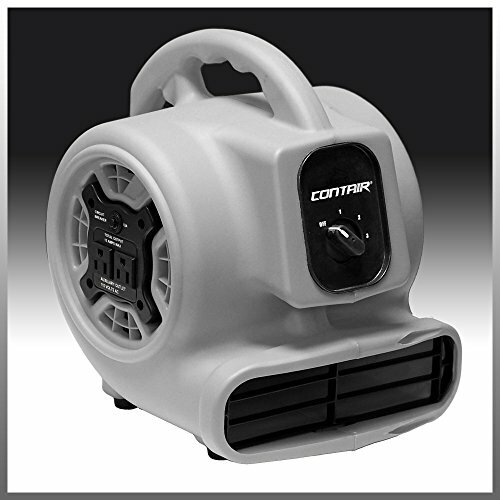 This compact floor air blower is made of lightweight polypropylene, and it has a size of 12.5″ x 13.5″ x 11″, 3-speed settings, a 15-feet power cord with built-in cord wrap, and a high-velocity airflow that blows over 25 feet. There are also onboard plugs so that you can link up to five fans simultaneously. Overall, this is a high-quality carpet fan and a great choice for both professionals and home users alike. A buyer shared that he didn’t expect such a small fan to generate such a powerful airflow and that his friends were also quite surprised. Another reviewer mentions that the Contair air blower fan is perfect for his carpet cleaning company and that this is the most powerful carpet fan that he has ever seen. A reviewer comments that the can feel the breeze from 15 feet away and it works noiselessly. Another happy purchaser states that he uses this floor fan in his pet grooming shop and he has no issues to dry the puppies with it. The user also says that the fan blower doesn’t get hot, and he is extremely pleased with its performance. The only thing customers complain of is that the Contair high-velocity carpet dryer is too small for what they need and they prefer to use a large model. 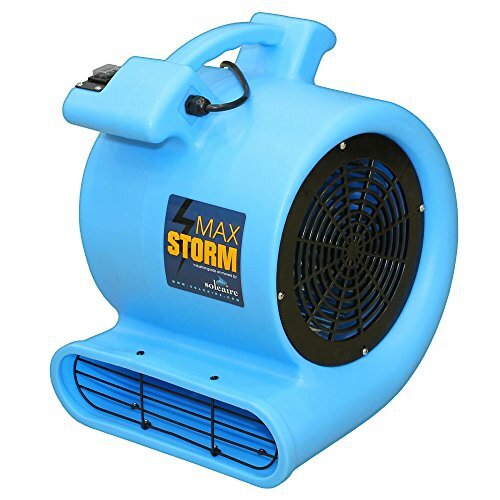 This blue floor air moving fan offered by Max Storm is well-made, efficient and a practical tool for drying carpets, floors, and walls. Users love the stylish design and the price, but some do note that it’s not as quiet as they would like. With a size of 16 x 16 x 18 inches, this floor blower fan has low amp draw, two separate speed settings, a 25-foot power cord, and three operating angles – across the ground, at an angle of 45 degrees and straight up in the air. You can also link it with other units for maximum efficiency. Overall, users agree that this is a top rated carpet drying fan, and they praise its performance and effectiveness. One buyer comments that one he used the Max Storm floor air mover continuously for several days, and it worked beyond his expectation. The reviewer states that the size of the fan is perfect for confined spaces and he has no problems to push it three feet under his house when he needs. 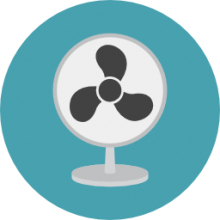 Another customer mentions that even though this fan flower is not as powerful as a commercial grade fan, it’s quiet and generates a significant airflow. The buyer shared that he managed to completely dry a floor for one hour with two of these top rated air movers. However, some customers are disappointed with the fan’s CFM and some state that there is a grinding noise present. One customer also complains that there are no proper instructions how to link the blower with other units. The Stanley high-velocity carpet drying fan offered by Lasko is practical, convenient, well-constructed and compact. Users love that the pivoting head and that they can point it in several directions, but some do note that they received a defective unit. With a size of 12.2″ x 9.62″ x 12.275″, this carpet dryer is made of durable plastic, and it has three speeds, a fused safety plug, a circuit breaker with a reset button, a rugged handle, and two 120 volt outlets. It weights only 7.6 pounds, and it’s ELT listed. Overall, this is an excellent floor dryer fan, especially for confined places. In general, customers are extremely satisfied with the usefulness, performance, and durability of the Stanley high-velocity floor drying fan. One buyer mentioned that he didn’t think it was possible for such a small fan to move such an amount of air and that he could barely hear it working. Another pleased user comments that he uses the air blower fan to dry his wet mopped floors and it does it quickly and efficiently. However, the buyer states that it draws more electricity than he expected – 103-watts on the highest setting. A reviewer shares that the Lasko yellow carpet drying fan is noiseless, lightweight and easy to move around, and he would gladly recommend it. But, some customers have complained that they expected a strong airflow and that the fan broke after a couple of weeks. Some also point out that it’s noisy and that it’s a challenge to clean it. The Stanely Lasko carpet fan was certainly a solid option with the reviewers we surveyed. Many reviewers say that they use these fans in their garage that doubles as a home gym. It circulates a great deal of cooling air, and it's also great for drying out their damp bedding, towels as well as carpet. Indeed, it has proven to be a personal and dynamic option for many users. One reviewer that wrote us says that on particularly high humidity days, they use it to dry their freshly mopped floors after their pets have had accidents on the linoleum. One buyer says that on the low, medium and high settings, it uses 76 W, 85 W and 103 W- which means that there truly is a higher power consumption at the higher fan speed settings. The Contair carpet fan was another high-velocity air-moving carpet dryer that we examined. It has three speed settings, a 15 foot power cord that includes an inbuilt power cord wrap, and provides 1,200 CFM airflow over 25 feet. The manufacturers claim that this is a state-of-the-art device that provides a lightweight and energy-efficient means of generating powerful flowing air. They particularly play up its multi-purpose functionality saying that it is ideal for drying out a flooded basement, cooling a hot room, and drying out laundry indoors on humid days. Reviewers, in general, were pretty pleased with this particular Contair FLO800GY high velocity carpet-drying fan-saying that they were surprised that even though it is very small and compact but it is actually incredibly powerful. Another professional carpet cleaner says that this portable unit is ideal for any of the jobs that he tackles- he brings it along in his truck to all of his residential and commercial job sites, highly impressed by its power and mobility. Another reviewer that we consulted says that they use it to dry out dogs and cats after they have been professionally groomed. Because it doesn't produce hot air that might be painful or damaging to pets, they just position it near the crates to quietly dry out dogs and cats. The Shop-Vac 1032000 Mini Air Mover was another attractive option- it is a stackable carpet fan that includes a 10-foot long power cord, a convenient carry handle and an airflow control with three different positions. 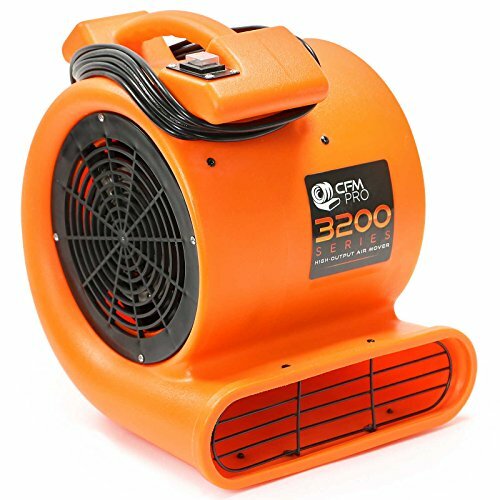 This 500 CFM air from moving fan is designed for all of the familiar uses, with the manufacturers saying that it is particularly excellent at drying out wet floors and carpets, as well as ceilings and walls. One buyer that we interviewed says that his commercial building provided these devices for his office after the air-conditioning went down during the summer. Once they were installed, they found that these high-velocity airflow movers were able to reduce the temperature a good 8° in under an hour. As well, they found that while the high speed setting was a little too loud for business purposes, a medium fan speed did the job- though they say the noise wasn't objectionable, really too loud to conduct business over. Other reviewers endorse this Mighty Mini air mover, saying that it pushes air a tremendously long distance. This is especially true if you compare it to traditional models like table and box fans- with a lot of users saying that even at over 20 feet away they can still strongly feel the flow of air. Most reviewers were really surprised at how small this air mover was- particularly buyers that were familiar with commercial units that pump out tremendous airflow, this miniature, high-powered air circulator provides a tremendous bang considering its diminutive stature, they said. Because it is so small and portable, it is easily positioned and repositioned throughout homes or worksites, allowing you to get the benefit of high-circulating air flow in confined and hot areas. Other reviewers say that the polyethylene plastic is truly unbreakable, despite it not being a style of high-impact plastic. Another reviewer says that because he lives in a small, cramped Brooklyn apartment without any airflow or ceiling fan, that he purchased this air mover to give his confined condo much-needed air circulation. Other buyers were impressed by the brand name, which was the tipping point for convincing them to purchase this particular model. This is a particularly heavy-duty option and provides a great deal of bulk and should you drop it on the floor from a moderate to high height- you can rest assured that is not gonna crack open. The Max Storm was another solid option. This carpet-drying to say and actually comes in three different colors-a purple, and orange and a blue, which is a nice consideration if you have concerns about blending your hair-circulating fan into your home decor. It features a 25 foot power cord that easily wraps around the top of the blower, has two different speed settings, and three different operating angles so that you can blow air across the ground, straight up, or at a 45° angle. Buyers, again, were fairly impressed by this air blower saying that it is incredibly powerful, not that expensive, although some users did report having a bit of a struggle stacking them. While some buyers look to rent carpet blowing fans, many people find that these multi-purpose devices have a range of different applications that makes them ideal to own. If you are looking to purchase a carpet dryer, check out the blower fan ratings on our page. Before you purchase from Harbor Freight, Lowe's, Target or Home Depot, do some research online and read what other reviewers have said about these carpet blowers to figure out which ones will best meet your needs.